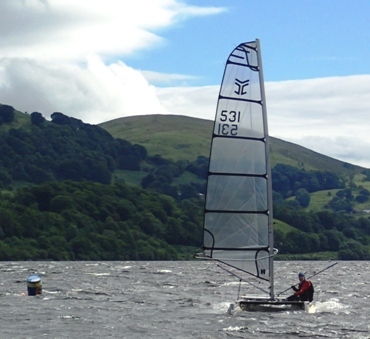 Catapult returned 1st-3rd July for a season highlight, the excellent sailing in the beautiful surroundings at Bala. 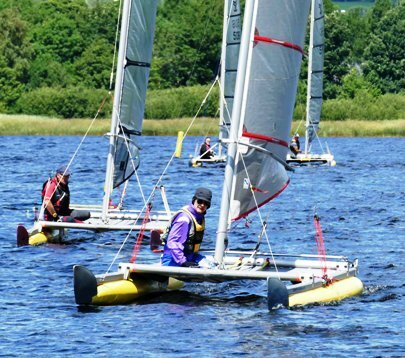 This year Bala Sailing Club stepped in to host the TT racing, at the top of the lake, with wide sailing water, and breeze from the unobstructed SW and NE. By coincidence, Catapult raced alongside the Tinker Tramps, bringing together for the first time two long-established sailing classes, with inflatable technology for lightness and convenience, and close racing; the club management, and friendly contacts between the fleets, ensured that the speed differences were effectively handled! Many of the helms congregated again at the Pant-yr-Onnen campsite, and their fleet sailed down to the racing. The club, with many fixed marks to play with, set figure-of-eight courses on Saturday and Sunday to give an excellent mixture of upwind, downwind and reaching legs, all of which could be used tactically. The upwind startline ran from the clubhouse to an outer mark, and for Race one, this meant tight manoeuvering close inshore in the last minute to gain the port-end advantage. After starting ahead, Stuart Ede over-stood and a tight pack led by Gareth Ede turned at the top mark for the series of reaches and runs. The fluctuating breeze down the long cross-lake reach could give big speed differences, with boats ahead hearing the ominous thrum of a boat behind catching the breeze and getting in the groove. Gareth stretched out over the second lap to come home a minute and a half ahead of Paul Ellis who in turn had a comfortable lead over George Evans and Stuart, with Mike Gough just catching Alastair Forrest by the end (photo above) for fifth. By Race 2 the wind was building from the south-west. 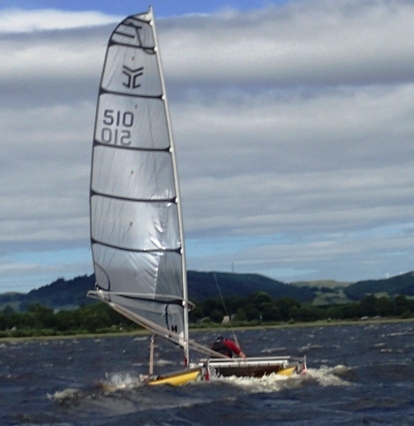 Alastair and Stuart led away in a starboard-end start using the club-house transits (photo below), with Gareth pulling out from further down the line. 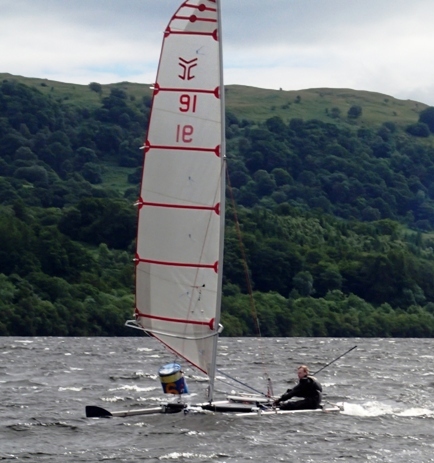 George pulled up to battle with Alastair up-wind, and Mike Gough came up in conditions that were becoming tough. Gareth stretched out for a good win over George in third, while behind 20 seconds covered Alastair, Stuart and Mike's finishes. 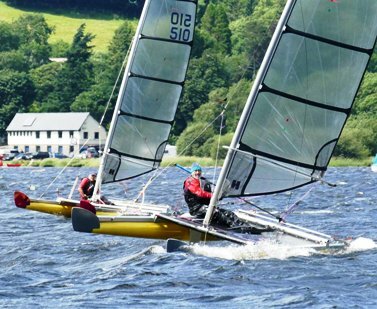 By Race three run back-to-back, the south-westerly was building strongly with steep whitecaps over the lake, making tacking and staying upright challenging. Stuart picked that the port end start was now favoured, setting off chased by Gareth and Alastair, these three moving out as the fleet spread out concentraing on surviving. By the end of first lap, a pitch-pole capsize, and elective retirements cut the fleet, including Gareth just out in front of Stuart. Alastair's pursuit of Stuart ended when he rode over the final downwind mark to let Mike Gough through to second. In the last short reach, both dived and staggered upright, but in the high loads Alastair's shroud snapped, the rig sweeping over, to finish up in the reeds. Behind, George survived (see photo) and gained third. The Race Officer reported gusts on-shore of over 30 knots, so 35 would be at least the strength out on the lake. 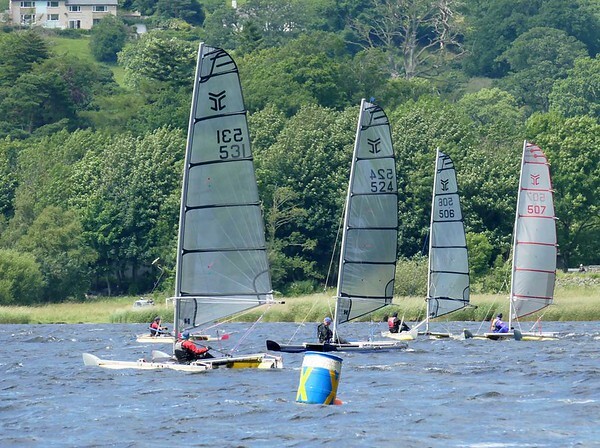 Sunday brought sunshine and a light NE breeze, a relief after the battles of Saturday but a barrier to the fleet sailing up from the campsite, needing a tow up the lake from Rob Baker' outboard tender. On cue, NE breeze died and turned WSW to give a light breeze, ample enough to race but with big gains or losses in the downwind legs when the breeze arrived or died. The club again set figure-of-eight courses with a shore-based start. For Race 5 Stuart and Alastair using the transits were away first, but Paul following pointed high to gain, and the boats crossing the start behind then got a big lift, carrying them almost to the top mark, so the fleet was close at the top. Stuart, Gareth and Alastair had a small lead, but downwind lulls and gusts carried the others up, for a pack around the two downwind marks. Gareth moved out ahead and Alastair went left up-wind on the second beat with an initial gain, and then a dismaying shift backwards. Gareth came in for another win, 30 secs ahead of Paul and then George, with Stuart 20 seconds further back, and Alastair Syd and Mike crossing within 20 seconds. Race six started quickly back to back, catching much of the fleet unawares. Mike Gough idling near the start line saw Stuart and Alastair bearing purposefully down on him, so sheeted in, and got away well with them. On the second upwind leg Paul and Gareth tacked early to the right out into the lake, with a big gain over the fleet carrying on along the shore, to fight out their own duel, with Paul holding on to the win by 10 seconds. Behind, Alastair held on to third, with Stuart 10 seconds ahead of George for fourth. Gareth Ede again dominated the six TT races, but three helms shared the first places. Gareth keeps a tight hold on the Travelling Tropy overall lead. Mike Gough was an emphatic winner on handicap, able to score 5 first places, displacing Chris Phillips (just, on countback) from the top spot in the Handicap series.